Venetian blinds are an excellent and very convenient system of protection from solar radiation, which provides fine control of light. 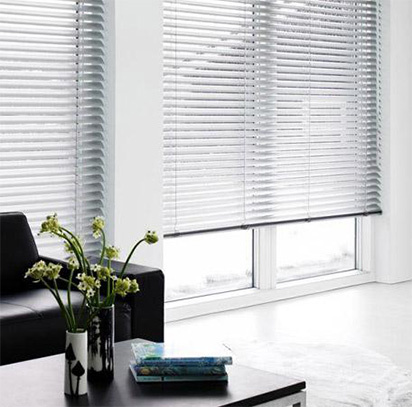 Not only they provide the desired lighting comfort, venetian blinds also protect your privacy from undesired views. They are simple to use and maintain, suitable either for your home or office. They are suitable for windows and doors, as they can be mounted on any type of joinery - metal, wood, aluminum or PVC. Venetian blinds as a system are made of aluminum slats of different widths and color spectrum. Widest use of venetian blinds is found in offices. Venetian blinds are installed in the openings of the window glass surface. Control is manual with plastic bar which allows the aluminum slats to rotate up to 180 ° and regulate the flow of sunlight into the room. They are produced according to the measures of openings. 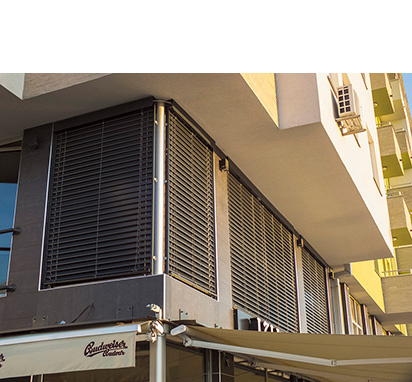 Solomatic jalousie are aluminum venetian blinds of larger dimensions, designed for outdoor protection for glass surfaces and for closed or open terraces. Their purpose is not only protection from the sun but also from other weather conditions (rain, snow, wind... ). Except protection they give the house an attractive look. The panels are made of solid aluminum sheet of trapezoid shape which gives them a special strength and makes them more stable. External guides are made of aluminum profiles with rubber bands that allow almost noiseless scroll slatas. Stave width: 60 and 80 mm. Slats resist even strong wind and always return to their original state thanks to flexibility. Due to the small dimensions of the mechanism box and the small package height in raised position ideal for installation underneath the facade leaving the glass openings uncovered. Possible manual steering with a crank and with electric engine with key or remote control.